Goodbye Pasadena Area Rapid Transit System (ARTS). Hello Pasadena Transit. Pasadena officials yesterday made official the new name and branding for the city’s transit agency at an unveiling event. The agency moves 1.5 million passengers annually on six bus lines throughout the city. Pasadena mayor Terry Tarnek said that the rebranding is partially due to the old name confusing some residents, leading them to believe buses only served area museums. The cost to ride a Pasadena Transit bus will remain the same — 35 cents for seniors, 50 cents for students and 75 cents for regular fare. The buses also help connect residents with the city’s six Gold Line stations. Streetsblog takes a first peek on a pending $300 billion five-year federal transportation spending bill. If it passes, it will be the first long-term transportation bill in more than a decade. Perhaps hinting at their first impressions of the 1,300 page bill, the photo accompanying the Streetsblog article is a package of the lactase supplement Lactaid Fast Act. Jokes aside, the bill in its current form will reserve $48 billion for transit projects and $205 billion for highways until 2020. According to Stephen Lee Davis of Transportation for America, it’s an allocation that appears to be a continuation of the transportation policy of the past 10 years with a slight spending increase and adjustment for inflation. Because no one in Washington is willing to raise the gax tax, the bill includes $70 billion in subsidies for the Highway Trust Fund from other sources. The subsidy could have been bigger, but late in the game, lawmakers backed off the idea of a six-year bill that would have reportedly cost $100 billion over and above what the gas tax brings in. Davis called the funding mechanisms “an accounting exercise” to avoid the appearance of deficit spending, even though that’s essentially what the bill does. In other words, highway subsidies are going to keep on climbing higher. Looking beyond the ongoing technical challenges and moral dilemmas that driverless technology presents, this LAT opinion piece looks at how driverless technology may be poised to transform parking in our region. With an estimated 18.5 million parking spots in L.A. County and more than 81 percent of space in downtown L.A. devoted to parking according to a new study, the automated efficiency of self-driving cars could decrease the need for parking spaces by being able to utilize existing space much more efficiently. If you’ve followed discussions about the potential benefits of driverless technology, the ideas aren’t anything new, but it’s interesting to see them being explored in such a wide-reaching publication like the Times. 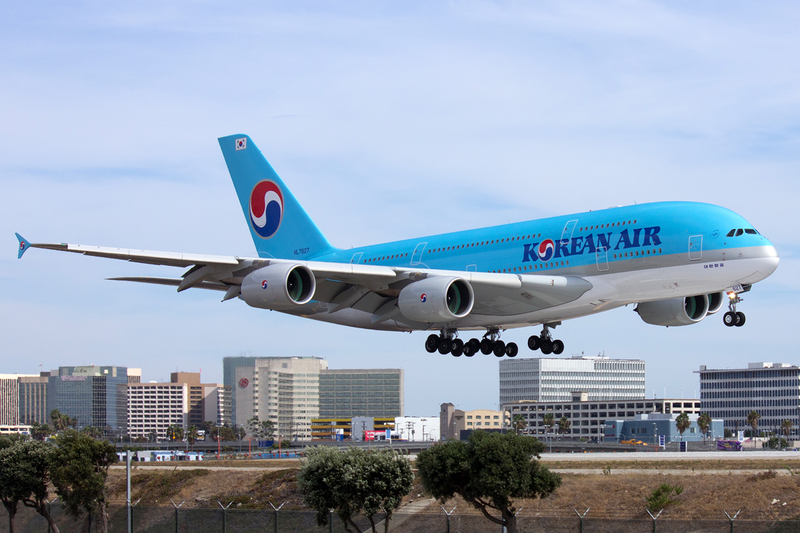 An A380, one of the most fuel efficient passenger planes currently in service, landing at LAX. Photo via Flickr user Charlie_tj. Your aviation-related transit article de la semaine looks at new research that shows air travel has become more energy efficient over the past four decades. A few of the reasons for the increased fuel efficiency are the airlines obsession with cost savings. Improving fuel efficiency saves airlines money. The ways increased efficiency is achieved are not only through more efficient jet engines, but also more aerodynamic and lightweight aircraft design features like wingtip fins, sharkskin-inspired paint, and composite materials. Oh, and here’s another reason you probably noticed: planes today are more full with more people stuffed into the same amount of space thanks to smaller seats. Today the average domestic flight takes off with 84 percent of its seats filled, up from 70 percent in 2002, according to federal data. (The number of people flying has been on a steady incline since bottoming out after 9/11 and dipping again following the 2008 recession.) Add up these and other factors and, according to Sivak’s research, you’ll find that flying uses 52 percent less energy than driving does to move one person one mile. The article notes there a handful of caveats with these findings, particularly when comparing the efficiency of air travel with cars, or buses (which is still the most fuel efficient way to travel). For example, due to the amount of fuel expended during takeoff and landing — about 25 percent of the fuel for a flight — air travel really only becomes more efficient relative to the same trip via a car on much longer trips. A short, connecting flight of 300 – 500 miles then is still inefficient in comparison. There’s still hope for green — or at least greener — air travel though, as other advancements appear to be not far off. These include bio-fuels and a new type of engine that will reduce weight and allow more air to flow around it for more efficient propulsion. Joe is on Twitter @joseph_lem. The A380 is pretty state of the art. I was amazed at how quiet it is when I watched the Singapore Airlines version touch down via 96th st. Without going into detail, there are handful of metrics that are not considered outside of in flight stuff. People don’t walk to the airport and with a full flight of 7-850 passengers, well. The airplane vs car question becomes more complicated when you take into consideration the fuel efficiency per passenger, plus the facts that there are still many older, less fuel efficient cars on the road, or vehicles with few or single occupants per trip, or the constant possibility of traffic congestion on the roads. With airplanes, increased weight may increase fuel consumption, and adding another flight due to higher demand would obviously require more fuel. Realistically speaking, though, it’s about time and money. Gas is cheap, and driving a few hundred miles (eg, socal to nocal) can be faster than dealing with airports – getting there, waiting in lines, flying, and then getting from the other airport to the destination. For longer trips (like LA to Seattle) flying might be a more attractive option. And that’s precisely where HSR fits in, especially when it has the advantage of carrying 500+ passengers within a short distance in the most efficient way possible. But the only other option than traveling by plane or bus between LA and SF is driving your car yourself all the way I-5 or taking the scenic route up US-101. Bus, plane, driving a car, they all aren’t the best ideal options for this short intra-California route. And unfortunately, the CAHSR is taking forever to build.